He said it to himself, his snakeskin boots making tracks in the desert. The winds had renewed the sand overnight and the sun was coming up, a deep, fleshy red. He angled his hat to shut out the flare. He laughed at this, without quite knowing why. His brain was starved of water. He stopped a moment and looked up into the sky where four big-winged silhouettes were circling. 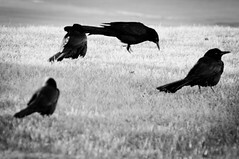 Grackles, maybe. The gravel slid beneath his feet as he shuffled on. He tried to think of what Caroline would say if she could see him. Probably tell him to get out of the sun before he burned. Fair-skinned devil, she’d called him, which she thought was one hell of a joke but really it was just racist. Not that he gave a damn. “She’d be right about the burn, though,” he said. His skin was starting to peel, sloughing off in his wake. It itched like hell. He laughed again, not because he thought he’d been clever but because he knew they’d never find him out there. He had sealed it for himself the instant he’d stepped off Caroline’s porch. “I gotta slither, sweetheart,” he said again. He could just about feel her watching him from the doorway. What did he think he would find? “You weren’t thinking, you were drinking,” he said. At first the night had seemed expansive, the stars shining in bands like sparks from a welder’s torch. But when he woke up that first morning the romance had sort of gone out of the endeavor. And now things were downright bleak. He turned and stared for a long while at the horizon behind him, bent to ribbons by the heat. He’d gotten turned around, that first day and in the two nights on either side, and though he thought he was looking back the direction he’d come, he knew well enough that forward and back were indistinguishable now. Maybe he was walking out into the desert, or maybe he was walking back home. “Something up ahead now, anyway,” he said. This is the third post in the series of writing challenges that I’m calling Stolen Identities Week. Check back for a new story each day this week, and maybe even write one of your own!